Halloween has come and gone, but I’m not yet finished with the crime serial called “Les Vampires!” In this episode, a new Grand Master takes charge of the Vampires’ ongoing quest to snuff out Mazamette and Philipe Guérande, but Irma Vep still gets most of the screen time. 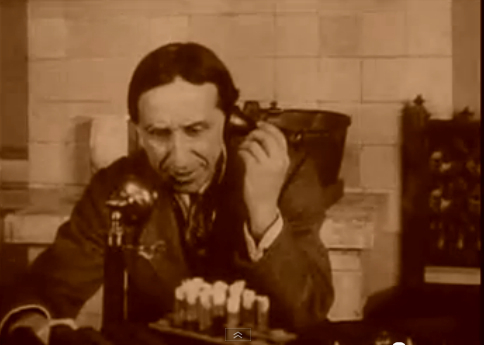 At the beginning of the movie, we establish “Venemous,” (played by Frederik Moriss) the “brilliant but deranged chemist” who is the new Grand Master of the Vampires, hard at work in his chemical laboratory, assisted by Irma Vep (Musidora). He receives a message with invisible ink on it, revealing it by brushing it with a special chemical. It states that Guérande (Édouard Mathé) is engaged to be wed to Jane Bremontier (Louise Lagrange), and that he visits his fiancée every day. He sends Irma Vep and two female collaborators to rent the apartment above Bremontier’s. They are able to learn about an upcoming dinner party and get the proposed menu from a maid. Venemous now calls the caterer and cancels the order, substituting Vampires for the caterers on the night of the event. On the day of the party, the Vampires are admitted and allowed to prepare and serve the meal. However, Jane’s mother gives a bottle of the champagne to the concierge to thank him for helping to bring up the food from the delivery, and when he tastes it, he dies! 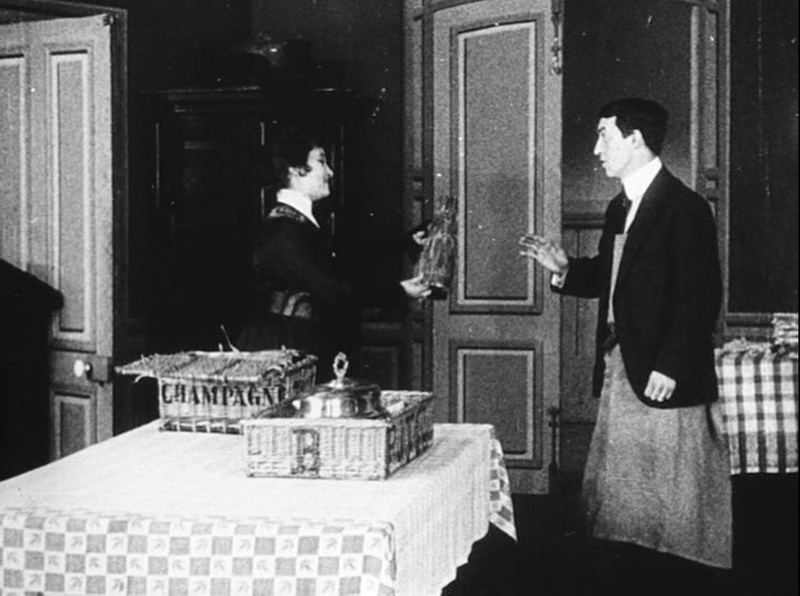 His wife runs up to the party to warn everyone not to drink the champagne, which no one has touched yet because Mazamette (Marcel Lévesque) is making a very long-winded toast. The Vampires in the kitchen realize the gig is up and escape out the window, but Venemous, who is dressed as a valet, must hide in a cabinet in the dining room. Mazamette tries to catch him in the dark, but winds up fighting with Guérande instead. Venemous is also able to escape over the rooftops of Paris. Now Guérande becomes convinced that he must move his fiancée to the country in order to hide her, but Irma Vep sees the car arrive to pick them up and takes a perfume bottle full of sleeping gas to surprise them. Mazamette has been hiding in a trunk on the side of the car, however, and he attacks her. Irma Vep is able to spray him with the gas and her accomplices remove him. Then, she hides in the trunk. Mazamette is dumped on the street and taken to the police station, believed to be drunk. When he wakens, he calls Philipe to warn him, but Irma slips out of the box and gets away in the car before Philipe can catch her. Musidora is horizontal for much of the film. Irma Vep now finds herself at a fancy restaurant in the Fontainebleau forest. She summons Venemous by telephone, but Guérande turns up first and attacks her, tying her up and leaving her on the road as a car approaches (almost a rare case of a woman tied to train tracks!). The car contains Mazamette, who stops at first to assist the damsel in distress before recognizing her. Guérande has been waiting nearby with a pistol, and now he joins his friend. They put Irma Vep in Mazamette’s car and go to lie in wait for the arrival of the Grand Master of the Vampires at the restaurant. 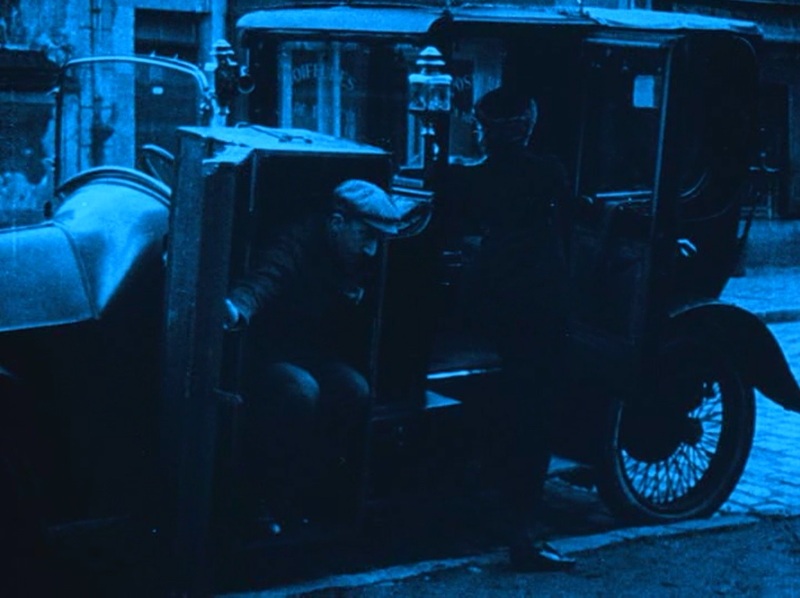 However, when he arrives, Irma Vep honks the horn with her head and he finds her there and they drive off together in Mazamette’s car, with Guérande and Mazamette in pursuit in his car. You’re doing it wrong! You’re ruining it for me! After a lively chase, Venomous leaps out of the vehicle; Philipe chases Venomous on foot, following him onto the top of a moving train, but Venomous gets away, shooting him in the leg. Mazamette has been restrained from jumping onto the train by two well-meaning policemen, and he punches one of them. He is held for assaulting an officer, but when Guérande shows up and strikes him in the police station, the police decide to forget the whole affair. I found this episode to be more visually satisfying than most of the others, in part because so much of it is shot on location in the streets of Paris or the forest of Fontainebleau. We get some nice blue tinting on the night shots. 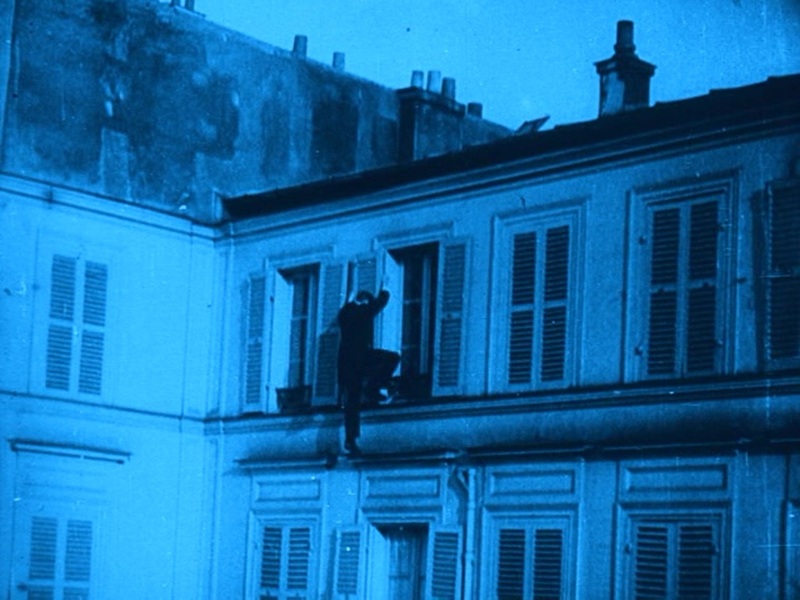 Also, there was a good amount of close-ups, including on Mazamette and Guérande when they first enter the darkened room, and some good camera angles when, at various times, Irma Vep is lying on the ground, and in order to see the figures escaping across the rooftops. Finally, the editing of the chase sequence was very satisfying, including some classic cross-cutting, even though I’ve seen critics who claim Feuillade never used any. The chase across the top of a train was, of course, similar to many Westerns that had already been released, beginning with “The Great Train Robbery,” but it is handled well here also. This is how Mazamette rolls. I usually criticize some aspects of the strained logic in each episode, but this one has only minor departures from logic. The biggest is that, since we’ve already established that Guérande is a teetotaler, it doesn’t make much sense to put poison only in his champagne, instead of the rest of the meal. Of course, it may well be that even a truly sober Frenchman has to sip a little champagne at his own engagement, so maybe that was safe. I was a little surprised that Venemous himself turned up at the party in the guise of a butler, but at this point we’ve gotten used to the Grand Vampires taking ridiculous and unnecessary personal risks, so we’ll give that a pass as well. There’s a somewhat silly bit when a figure in Vampire disguise climbs up a drainpipe – in order to deliver a perfume bottle in Irma Vep. Surely the front door would work just as well. The one part that doesn’t make much sense to me is why is Mazamette riding in the trunk in the first place? Surely the Vampires are going to assume that he is wherever Guérande and his fiancée are, so it doesn’t seem like it would really help much in terms of security. Still, it’s a minor point and doesn’t interfere much with the enjoyment of this episode.